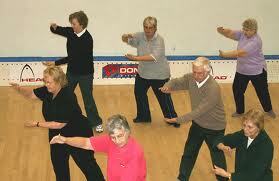 Tai chi, a gentle and yet an effective exercise is the perfect workout for the elderly, according to a study. Experts say the gentle martial art builds strength and also improves balance control, reducing the chances of life-threatening falls among old people. Elderly people whose eyesight is failing can improve their balance and avoid dangerous falls by practicing tai chi. Researchers from the Hong Kong Polytechnic University set up a four-month program for 40 people aged over 70 living in care homes. The volunteers had three 90-minute tai chi sessions a week. Each session was designed to help volunteers practice shifting their weight gradually, rotate their heads and torsos and become more aware of their limbs, thus improving their co-ordination. Results, published in the Age and Aging journal, revealed volunteers who practiced had far better balance than a control group who were taught to play an instrument. Repeated head movement is one of the important elements in tai chi, and this can help to stimulate the vestibular system to improve balance control. ‘This study’s results agree with those of a previous study which reported that the knee joint proprioception of persons with normal vision could be improved with 16 weeks of tai Chi training. This study extends those findings to visually impaired older people,’ according to Tsang. ‘It would be interesting to extend this study to involve community dwelling older people, who tend to be more independent and could benefit differently from the training,’ he added.